TERRIFIC TODDLER LEARNING TOY: 12 charming eggs in a carton will help preschoolers learn to count, sort, and match! 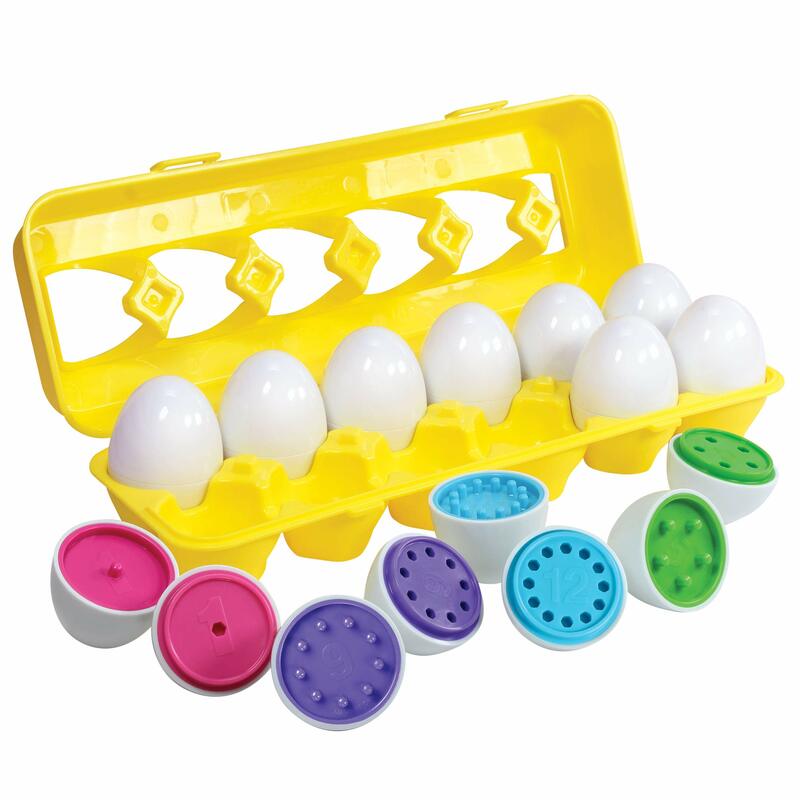 Each plastic egg contains a different color and number, with corresponding pegs and holes. DURABLE CASE INCLUDED: Made with top quality child-safe materials, this is a toddler toy built to last. And when it's time to end play and pack away, you'll find the sturdy plastic case super convenient for quick 'n easy storage. CHILD FRIENDLY DESIGN: The shape of these smooth eggs are perfect for little fingers to grasp and maneuver. They'll be able to click 'em together and pull 'em apart effortlessly, encouraging independent play. Great for 18m, 2 and 3 year olds and up. 100% SATISFACTION GUARANTEE: Above all, your satisfaction is our main concern! Please contact us in case you run into any problems with your order, and we'll be happy to work things out for you. An Engrossing, Open-Ended Toy to Encourage Learning Make the most of your child's priceless first years by giving them the toys that will develop their brain and set the foundation for future learning in a fun, engaging way. Enter the Kidzlane Count & Match Egg Set, an educational powerhouse packed with features! This set contains 12 uniquely colored eggs that split in two, revealing a unique color, number, and combination of pegs 'n holes. With an easy-to-hold, smooth shape perfectly sized for little kids, these adorable eggs are sure to hook your tot's attention as they try to take 'em apart and put 'em back together! This set is completed by a bright yellow plastic case, so that it's easy to carry and store the eggs. Keep Toddlers & Preschoolers Occupied for Hours! The Kidzlane Count 'n Match Egg Set includes many different features that will appeal to little children's natural curiosity. Can I open the egg? What's inside? How can I put it back together? Watch them figure out the answer to these questions, while they build valuable basic skills such as sorting, counting, color coordinating and matching. Having a play-date over? The Count & Match Egg Set is sure to be a winner! Keep them occupied with enough pieces to go around for everyone. Or, incorporate the eggs with food pretend play for a fun learning experience in the play kitchen! Why Choose Kidzlane? Annoyed by cheaply built toys that fall apart instantly? We know durability is a must when it comes to children's toys. The Count & Match Egg Set is a long-lasting, kid-proof toy that will be passed on from child to child. Buy once, so they can enjoy forever! Kidzlane toys are built with premium quality materials according to the top manufacturing standards. We seek to ensure the safety of our children by sourcing only non-toxic, child-safe material, and having each product tested by a rigorous quality control team. We're passionate about occupying little hands and minds with toys that will inspire learning and creativity. When you buy a Kidzlane product, you'll get the best in fun, innovative toys along with our 100% quality commitment.